This summer, Openlab, the London-based open source art and technology collective, presents a series of in-depth summer workshops exploring creating and hacking media using free software and tools.Â Â Workshops will include both beginner and advanced instruction in such software as PureData, Processing, and SuperCollider, as well as using the microcontroller Arduino, Android programming, general sound hardware hacking, and more.Â For less than the cost of the cinema, you can gain some valuable skills using free software! Cost: Â£15 for the entire night, or per workshop (see below). How to pay: At the door, or via Paypal to be guaranteed a space (limited to 30 people per workshop).Â Please email workshop@pixelism.info to reserve a space in any workshop. Dan will continue the introduction to SuperCollider, building on the basics to create reusable synths and use them in musical patterns, including pre-defined patterns and generative music. Depending on time and interest we may also look at other topics such as handling audio files. 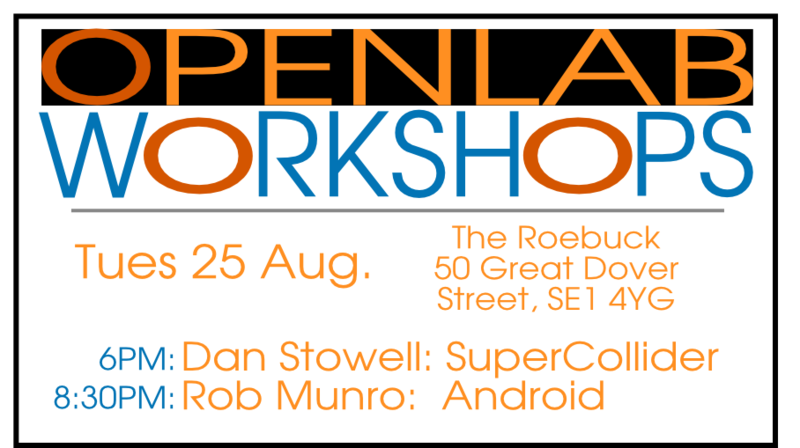 This 2-hour workshop is the second in a series of summer workshops, but if you weren’t at the first workshop then you’ll probably be OK to follow if you already have some experience of SuperCollider or if you’re already comfortable with programming languages.Â You’ll need a laptop with SuperCollider 3.3 or 3.3.1 installed (download). Rob Munro will take students through the install process of the development environment, Linux and Windows and are preferred, but the process should be similar on Mac as well. After the install we will looks at some the basics of android development, the android manifest file, Activities, Services & Databasing as time will allow. This will be a 2-hour workshop, some Java experience will be very helpful though not essential. An android phone will handy as well but the emulator is included in the install. Posted by evan.raskob on Tuesday, August 11th, 2009, at 1:41 am, and filed under Uncategorized. You can post a comment, or trackback from your site.